2003 brought a seismic shift in statementing policy in North Yorkshire. In April that year the county began delegating more resources to schools (link, p5) - effectively beginning a process of replacing statements, leaving children on School Action or School Action Plus. The authority began giving more money directly to schools to meet the needs of children with SEN, reducing the 'need' for children to go through the statementing process and the provision that would follow. There are two ways to actively achieve reduction - by removing existing statements and by a change in eligibility criteria, reducing the number of new statements issued. Compare this drop to the number of appeals to tribunal (SENDIST), full post here, and reproduced in an adapted graph below. 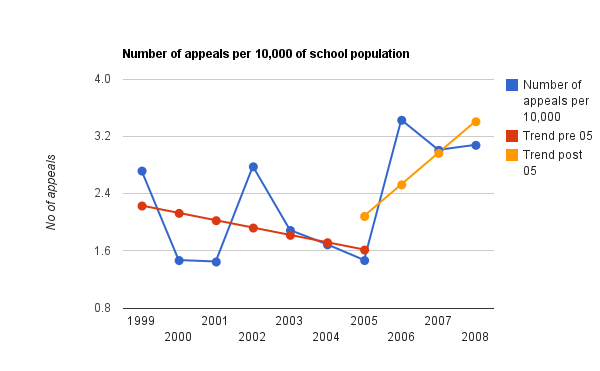 Given parents would have to try out the statement-free provision for their children before deciding whether it was appropriate or not, and that it takes approximately 6 months for an appeal to be heard by SENDIST, the more than doubling of number of appeals per 10,000 from the academic years 2005 to 2006 is easily explained. Parents were obviously not convinced that the alternative provision was adequate. Of interest would be to compare how many appeals were won or conceded by North Yorks and how many appeals were withdrawn by parents pre and post 2003. SENDIST, alas, does not provide that data. The profound danger in the Audit Commission's report being used as the starting point for national debate is that the report repeatedly claims that most problems in the field of special educational needs arise from aspects of the statutory framework. This is simply not so. Most problems (including those detailed in the report itself) are caused by LEAs' determination (and current licence) to disregard the statutory framework. ... statements do provide a measure of protection for some of the most vulnerable pupils and assurance for parents that their child's needs have been carefully assessed and addressed. A statement represents a legal guarantee of suitable provision for a child, a guarantee that does not apply to children under School Action or School Action Plus. Looking at the SENDIST data post 2003 speaks volumes. * A note the graph. SENDIST reports by academic year. North Yorkshire's policy changed in April 2003, so the effects of the change don't show until the following SENDIST report from 2004-05. The trend lines are calculated on this basis.